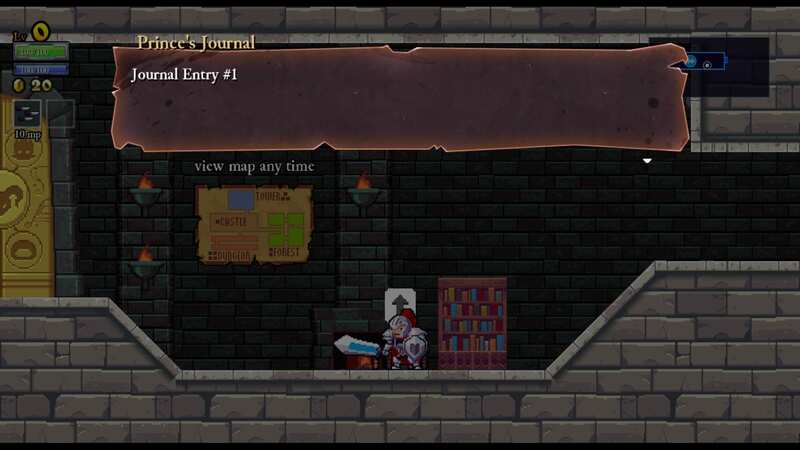 There are few names in video games that so aptly describe their product than Cellar Door Games’ Rogue Legacy. For this game is truly a legacy of the rogue games that came before it. However, it does take many modern innovations and uses them to update the formula. While the term rogue is often used nowadays to delineate a game that is difficult, what it originally stood to mean was more in line with randomness and procedurally generated assets. This tended to cause a high degree of difficulty much of the time, but sometimes that would also make things easy. If a dungeon is randomly generated but the exit is two steps away from where you entered, than that wasn’t very hard at all. Likewise, while this game can be a bit difficult, it is not brutally punishing. It does, however, pride itself on unpredictability. At its roots you start with rogue like elements, and then you build from there. Instead of an rpg or even arpg, the gameplay itself bears more resemblance to the metroidvania style games. In fact, many have called this game the best Castlevania in years, although it had nothing to do with Konami themselves, unsurprisingly. But before there were the other great homage retro games, such as Shovel Knight and Axiom Verge, there was this gem on the PC. The game begins with a short sepia toned stage that teaches you how the controls work and the end of which marks an event that sets the whole story into motion. However, you are not given any actual story text other than a few cryptic lines like “My duties are to my family…” It is only through much exploration and reading of journal entries that you will be able to fill in the gaps to the story. This marks one of the modern gaming conventions added into the game, and is especially reminiscent of how you have to hunt for story clues within text in the Souls games. This is not the only homage to the Souls games therein, and we will return to that later. Journal entries fill in story details. The story, however, takes an intentional back seat to the gameplay. This is a very old school game, with old school aesthetics, with the addition of a few new school ideas where it was determined to be an improvement. Certainly I do not mind not having to input a continue code, thankfully gone is that old mechanic with the cartridges lacking battery backup. Another modern convention that has entered into the game is persistent upgrades. Many modern roguelike games introduce this mechanic, and this one bears a lot of similarity to the way that the Souls games handle it. In fact, the developer themselves admit this was their inspiration. There is one currency, this time gold instead of souls, and it is used to either upgrade your character stats or purchasing equipment or runes. 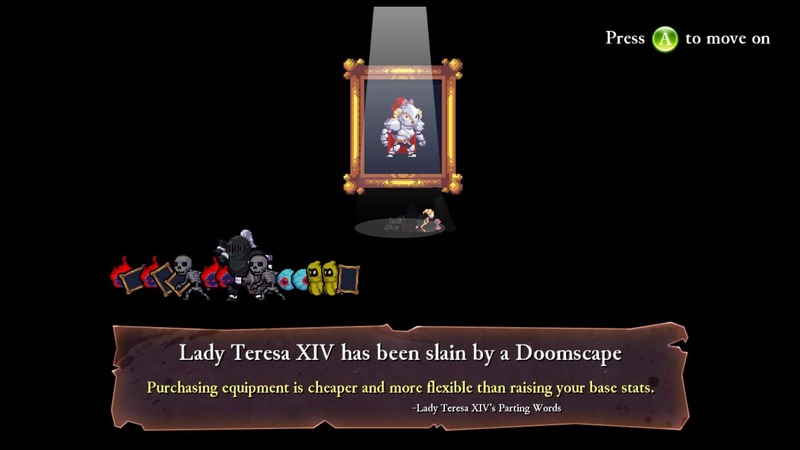 Thankfully, unlike Souls, when you die you keep your gold by the inheritance mechanic, but you cannot upgrade anything until that actually happens. Before you can re-enter the castle, though, Charon stands at the door to take all your gold. You can upgrade Charon to only take 50% of your remaining gold, but that takes quite a while to achieve that kind of wealth. 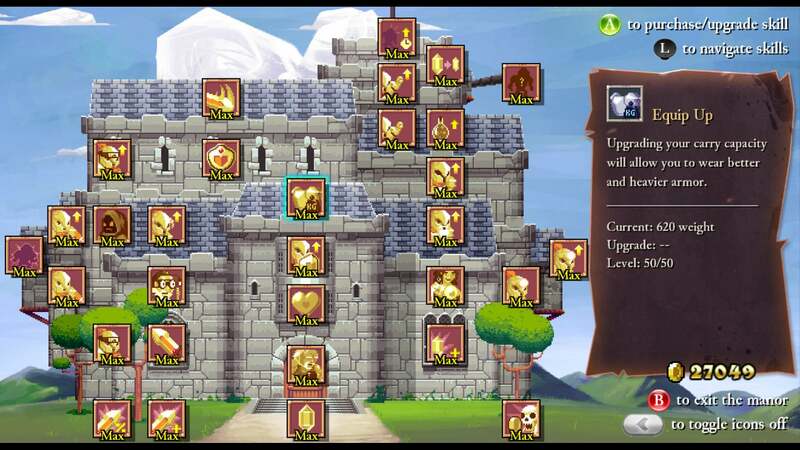 Your best bet is to spend as much of your inherited gold as you can on upgrades before you re-enter the castle. The upgrade system starts with a couple entries, and as you purchase each entry for the first time, it unlocks a new entry. This is visually represented by growing your family’s castle. As your family gains power and experience diving into the haunted castle, the family’s own property grows in magnificence and your descendants start with more power and better goods. So it is quite the subtle little thing, but it makes a lot of sense when you stop and think about it. Some of the more important upgrades are to add the Blacksmith, Enchantress, and the Architect. With the Blacksmith you can purchase upgrades and equip them, but you have to find the plans for those upgrades within chests in the dungeon. The Enchantress can add runes to increase your abilities (such as double or triple jumps and dashes, etc), but likewise you have to locate plans for those runes within the dungeon. Plans are usually located in special chests, either Fairy chests which have a certain room requirement to achieve them, or mini boss enemies that are randomly scattered throughout the dungeon. The Architect will lock your previous dungeon in, so that your next run will not be newly randomly generated and you will still have the same map coverage that you ended with in your last run, but at the charge of a percentage loss of gold. You may choose to do this if you would like to immediately take on a boss that you died on, but generally this is to be avoided because the gold lost from defeating that boss is rather large. You may call me Your Majesty or God-King, your choice. 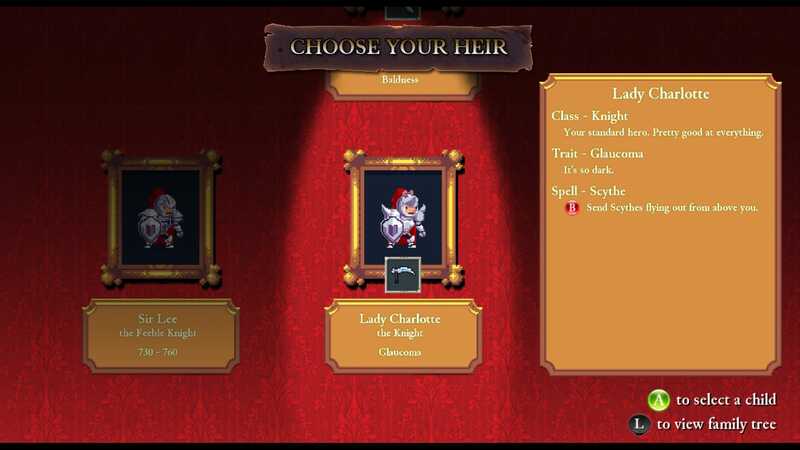 Initially you have access to four classes; Barbarian, Knight, Knave, and Mage. You can unlock other classes such as the Shinobi, Miner, Lich, and Dragon. Additionally each class, other than the Dragon, can be upgraded as well. Each class has their own strengths and weaknesses, such as the Barbarian has the highest health, but the Shinobi hits the hardest (at the cost of no ability to critical hit). When you upgrade each class, they each also gain a special class ability. After you die, you have a choice between three of your children that is to be the next to dive into the haunted castle, this can later be upgraded to give you one re-roll of those children. They will randomly have classes allotted, and they will also have certain birth attributes (or defects if you like). These can be largely beneficial, such as OCD where each destroyed object in the castle returns you a small amount of mp restore, or largely negative, such as Glaucoma which causes your vision outside of the center of the screen to become blurred. There are also a few attributes that are neither good nor bad, such as baldness and sexual preference. The latter did cause a minor stir when the game was released because people thought they were including gay sexual preference as being a defect, but the developers strongly denied that was the case. But with some very difficult inherited attributes, you may end up wanting to take a class that you don’t necessarily prefer in order to avoid that defect. Certainly “Barfsville” is something I avoided as much as possible. I have a prescription for it. 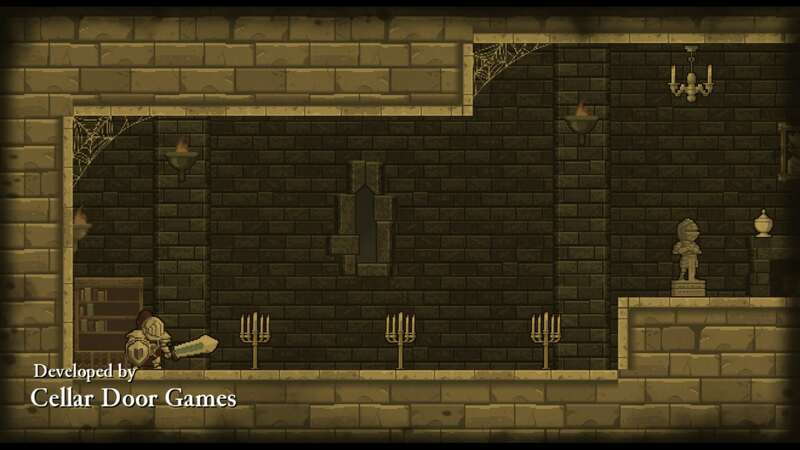 There are four regions of the castle, with new enemy types and a boss that governs over the area in their own boss room. The goal of the game is to beat the four bosses and then to enter the door at the beginning of the castle to face the final boss. Thankfully, you do not have to beat all four in one playthrough. When a boss is defeated, their emblem lights up on the door, so you don’t have to re-engage them. If you choose to, there is a shadow form of the boss in those boss rooms that you can indeed face, but that is an extremely difficult and entirely optional challenge for veterans. Defeating all the shadow versions unlocks a secret class, but it not necessary for the game proper. After you have defeated the final boss, you can begin a New Game+. And, also like the Souls games, the enemies are rebalanced when you start a new game plus. So many of the enemies you faced at the end of your previous play through, will be at the start of the castle in your next run through. However, you also gain an overall boost to received gold with each subsequent play through. One of the largest upgrades, though, is that new recipes will be available to you. The best weapons and armor in the game cannot be achieved until New Game+. So the game actually has a lot of replay value. Bosses can almost resemble a bullet hell shooter. The game is justifiably considered a classic by many. And this is a game that was one of the earliest examples that retro could be both cool and inventive. There was a very small development staff, and they invested $15,000 of their own money into the development. The game returned that investment within an hour of its release. Whether you want to play a retro style metroidvania, or you want to engage in a roguelike challenge, this is a very great game to pick up and play. Chances are you own a console which it has been released on. I personally own it on PC, PS4, PS3, and PS Vita, and it works great on all those systems. My personal favorite system to play on was the PS4. While not absurdly difficult, the game still does reward precise control movements, so the controller that you feel the most comfortable on will probably be your best bet. As an expression of the game type that this title is aiming for, you would be hard pressed to find a better example. This is a game that very easily can slide it’s hooks into you and not let go until you are a bloody mess. 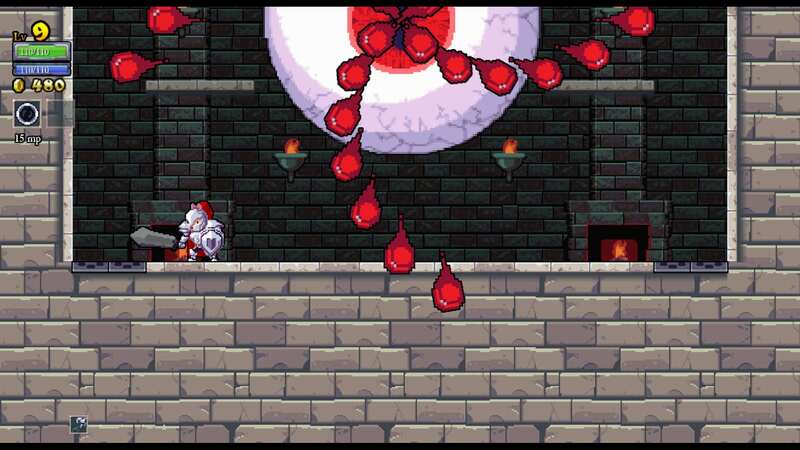 Rogue Legacy is currently available on Steam for $4.49. It’s been available on PSN for similar prices and has had sales for even lower. If I remember correctly, I have never paid over $10 for it but I have played it for over 50 hours prior to reviewing the title. A ton of bang for your buck. This review was based on the PC, PS4, and PS Vita versions, self purchased. The boatman is making bank from your tribe. We’re in the poor house. Unlikely to live long enough to see the amusement park. The game gets pretty brutal at this point. But there is fun to be had beyond the end.